When our patients have lost numerous teeth, we know they are dealing with a stressful and painful situation. Replacing missing teeth shouldn’t add to their stress. We are happy to offer a wide range of dental restoration options to put the smile back on their faces. Following advanced tooth loss, we typically recommend a partial or full denture. By combining these custom crafted restorations with dental implants, we can nearly recreate the flawless natural appearance and function of patients’ smiles. If you want to find out more about your tooth replacement options from our team, give the Torbram Dental team a call today. One of our friendly team members will schedule a treatment consultation for you in our state-of-the-art Brampton dentistry office. During your consultation, we’ll review your current oral health, past health history, and treatment options. We’ll partner with you to create a personalized smile restoration plan to deliver healthy, flawless smiles. Partial dentures are advanced restoration prosthetics that fill the gaps between healthy remaining teeth. They are crafted using a gum colored base material to support replacement teeth. Traditional partials are held in place using clasps attached to surrounding teeth. An implant partial denture is held in position using two to four strategically positioned implant posts. Full dentures are used to replace an entire row of lost teeth. Traditional dentures are held in position through suction between the gums and denture base. 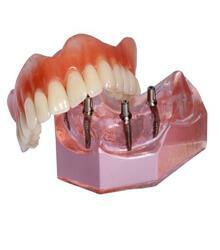 An implant denture is affixed to between four and six dental implant posts. 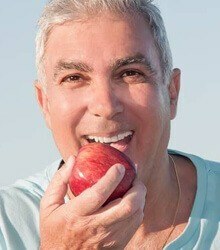 Dental implants replace missing tooth roots and create improved stability and longevity for partial and full dentures. 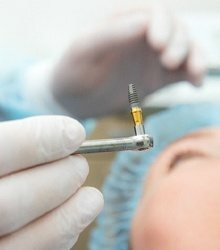 To have your dental implants placed, we make a small incision in the soft tissue. Then, we position the implant post into the jawbone. Once in place, your dental implant is covered with a protective cap that allows the posts to fuse with the gums and bone tissue over the course of several months. Once the implant has fully fused with the gum line, we attach an abutment that will connect the implant to your partial or full denture. Once your implant retained partial or full denture is in place, you should brush at least two times a day, morning and before bed, as usual. However, for optimal results, we recommend brushing after meals as well. We may recommend using an antimicrobial mouth rinse to remove plaque buildup from difficult to access parts of the smile. An air or water flosser may also be effective in removing plaque from between the gums and denture. During six month dental exams and teeth cleaning appointments, we’ll be happy to offer recommendations to help you keep your dental implant whole and functional.